Knoxville, TN – The #24/RV Lady Vols (16-10, 7-6 SEC) will look to move up in the tightly contested SEC standings as they head to Baton Rouge for the penultimate road game of the season against LSU (8-18, 2-11 SEC). Tipoff is slated for 1:00pm CT/2:00pm ET at Pete Maravich Assembly Center and the game will be broadcast on ESPNU and available online at WatchESPN. Sunday will be LSU’s home “Play 4Kay” game, coming on the heels of UT’s “Live Pink, Bleed Orange” game. Play 4Kay events are held in honor of late NC State coach Kay Yow, who lost a long and hard-fought battle with breast cancer on January 24th, 2009. The Kay Yow Cancer Fund has raised more than $5 million for research. UT had its breast cancer awareness game on Thursday night, and Champions for a Cause, an organization founded by UT’s Holly Warlick and LSU’s Nikki (Caldwell) Fargas presented a check for $15,000 to the University of Tennessee Breast Center. Warlick and Fargas hold events, including long distance motorcycle rides, to increase awareness and raise money to fight breast cancer. Under Holly Warlick, Tennessee is 31-16 in road games, 61-9 at home and 10-5 at neutral sites for a total of 102-30. The Big Orange women remained in the AP poll this week, rising from No. 25 to 24, making it 565 weeks in a row the Lady Vols were in the top 25. UT dropped out of the USA TODAY Coaches Poll on February 9th for the first time since the final poll of 2008-09 and for only the second time ever. The Lady Vols remained out again in the February 16th poll. The Big Orange women are 567-56 (.910) in all home games, beginning with the 1974-75 season. Tennessee is 414-32 (.928) all-time in Thompson-Boling Arena (1987-88 to present). Sunday’s contest will mark the third game in seven days for the Lady Vols, who fell to #3/2 South Carolina at home on Monday, 62-56, and pushed past Ole Miss on Thursday night in Knoxville, 57-51. The Lady Vols led by seven entering the fourth quarter (46-39), fell behind by one (51-50) with 2:39 left and then rallied for a six-point win. Tennessee’s reserves scored nine of its 11 points in the final stanza, led by five from Kortney Dunbar over 31 seconds in the game’s final 1:36. UT won with Mercedes Russell (inj./played two minutes) and Diamond DeShields (0-4 FG/0-2 FT) going scoreless. Bashaara Graves, though, posted her second-straight double-double effort with 15 points and 12 rebounds. It was her seventh of the season. Tennessee won for the fourth time in the last six games. The Big Orange women improved to 12-4 at home this season, including a 5-2 edge in SEC play. UT trailed 33-30 at the half vs. Ole Miss, and the Lady Vols had entered the game 0-5 when leading at the break this season. UT also won a game it trailed in the fourth quarter for only the third time in 13 games and for the first time since beating Wichita State (58-51) on December 11th after being behind by two on the road. The Lady Vols have played a brutal slate this season, facing what the NCAA ranks as the No. 1 toughest strength of schedule in the nation. Because of that, Tennessee stands at No. 19 in the NCAA’s Feb. 19 RPI and at No. 24 in the AP poll with a 16-10 record. Diamond DeShields is Tennessee’s leading scorer in 2015-16 at 13.3 points per game, but six different players have been UT’s leading scorer or tied for game honors in the last six games. Mercedes Russell and Bashaara Graves also score in double figures at 10.2 per game. On the boards, Russell averages 8.4 rebounds per contest to pace Tennessee, followed by Graves at 8.3. Tennessee repeated its 10th different starting five of the season on Thursday night, with Bashaara Graves, Jaime Nared, Mercedes Russell, Te’a Cooper and Andraya Carter reporting for the opening tip. Holly Warlick is in her fourth season as Tennessee’s head coach, and she possesses an impressive 102-30 record during that time. She is only the 17th women’s basketball coach to reach 100 wins in her first four seasons at the NCAA Division I level. LSU enters with an 8-18 record (2-11 SEC), having lost six straight and 10 of its last 11 contests. The Lady Tigers are coming off a 68-54 loss at #12/12 Texas A&M on Thursday night. Rina Hill and Alexis Hyder tallied 14 and 13 points, respectively, in the loss to the Aggies. Despite being undersized compared to A&M, LSU outscored the hosts in the paint, 22-20, and had a 17-16 edge on second-chance points. 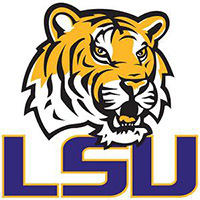 LSU only scores 54.1 points per game, but the Lady Tigers limit their opponents to 57.8 points per contest. Coach Nikki (Caldwell) Fargas’ squad has 13 on the roster but only eight played on Thursday night. That is an improvement, as sophomore Jenna Deemer and senior Ann Jones returned to action after missing several games, upping LSU’s number of available players from seven to nine. Alexis Hyder leads LSU in scoring at 11.3 per game, followed by Jenna Deemer at 10.1. Raigyne Moncrief had been the team’s second-leading scorer at 10.3 ppg., but she was lost for the season to an injury three games into the campaign. UT has a 47-13 advantage in the series, including a 15-6 slate in Baton Rouge, a 20-3 record in Knoxville and a 12-4 mark at neutral sites. Tennessee has won three straight in the series and 10 of the last 11 meetings. The Big Orange women have won in their past four trips to the PMAC, last losing on February 26th, 2009, 66-63, as an #18/23-ranked team to unranked LSU. These teams are 1-1 in overtime contests, with each team winning one on its home court, and UT leads in postseason play, 13-4. Tennessee improved to 20-3 in series games played in Knoxville on January 22nd, 2015, as the #5/7 Lady Vols cruised, 75-58. Tennessee won in its last trip to Baton Rouge on February 27th, 2014, as UT took advantage with a 72-67 road win over the #RV/23 hosts. The Big Orange had a 21-point halftime lead before seeing it disappear at the hands of a furious LSU rally that tied the score at 59 with 3:28 to go. Meighan Simmons scored seven points in the closing minutes and finished with a game-high 31. Cierra Burdick had a double-double in that contest as well, scoring a career-high 22 and adding 10 rebounds. Isabelle Harrison added a double-double of 11 points and 11 rebounds. Holly Warlick is 4-1 vs. LSU, with the only loss coming on January 2nd, 2014, as the #16/16 Lady Tigers upended the #5/5 Lady Vols, 80-77, on the day UT retired Candace Parker’s jersey. A crowd of 14,437 was on hand to see UT lead by as many seven, trail by as many as 16, cut it to one with :16 to go and lose by three on that day. The Lady Vols and Lady Tigers met for the third time during the 2013-14 season in the SEC Tournament quarterfinals, with UT coming from 15-down to triumph, 77-65, in Duluth, GA. The programs faced off in the 2012 SEC Tournament Championship game at Nashville’s Bridgestone Arena on March, 4, with UT prevailing by a score of 70-58 to win its third-straight tourney title and 16th overall. The Lady Vols and Lady Tigers met in the 2004 and 2008 NCAA Final Four semifinals, with UT narrowly winning by scores of 52-50 and 47-46, with the 2008 squeaker sending Lady Vol Candace Parker and company to the title game and an eventual win over Stanford, 64-48, at Tampa, FL, in Tennessee’s last NCAA title and trip to the Final Four.